Courtesy of Westdeutscher Rundfunk (WDR Radio) Archive, Cologne. On May 26, 1953, Westdeutscher Rundfunk (WDR Radio), in Cologne, Germany, presented neues Musikfest (New Music Festival), one of the first public concerts of “electronic music” (elektronische Musik) in Germany. 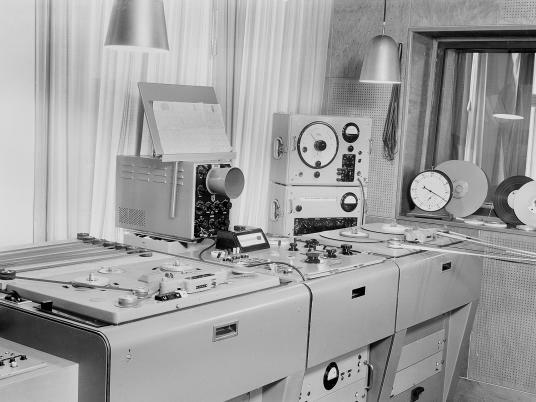 A result of the technical and creative innovations developed at the Studio for Electronic Music, founded at WDR Radio in 1951 under the direction of composer Herbert Eimert, neues Musikfest broadcast pioneering sound composed entirely using electronic equipment. In the late 1940s and ’50s, innovative composers from across Europe and North America flocked to Germany, performing and broadcasting on German radio stations and developing new techniques, equipment, and compositional styles that continue to influence music around the world. Presented in conjunction with the exhibition Inventur—Art in Germany, 1943–55, Sound Inventur highlights pioneering techniques and innovations in electronic and experimental music alongside the creative influence of avant-garde music by French and American composers that took hold in West Germany in the immediate postwar years. This program is part of a series of Sound Experiments at the Harvard Art Museums, which takes advantage of the surround sound system in Menschel Hall to consider nonvisual creative practice. This program will take place in Menschel Hall, Lower Level. Please enter the museums via the entrance on Broadway. Doors will open at 7pm. From 7 to 8pm, guests are invited to view the Inventur exhibition on Level 3. Free admission, but limited seating is available. Tickets will be distributed beginning at 7:30pm at the Broadway entrance. One ticket per person. The Harvard Art Museums are deeply grateful to the German Friends of the Busch-Reisinger Museum (Verein der Freunde des Busch-Reisinger Museums) for making the exhibition catalogue possible and for providing additional funding for the exhibition. Major support for the exhibition and related programming comes from endowed funds, including the Daimler Curatorship of the Busch-Reisinger Museum Fund, the M. Victor Leventritt Fund, and the Richard L. Menschel Endowment Fund. In addition, modern and contemporary art programs at the Harvard Art Museums are made possible in part by generous support from the Emily Rauh Pulitzer and Joseph Pulitzer, Jr., Fund for Modern and Contemporary Art.